McGinley backing McIlroy in a gunfight: "When Rory got in Dustin's rear view mirror at the FedEx, there was only one winner"
when Rory got in his rear view mirror at the FedEx Cup last year, there was only one winner. Talk that Rory McIlroy is destined to win the Masters sooner rather than later can only delay the Co Down's man date with destiny. 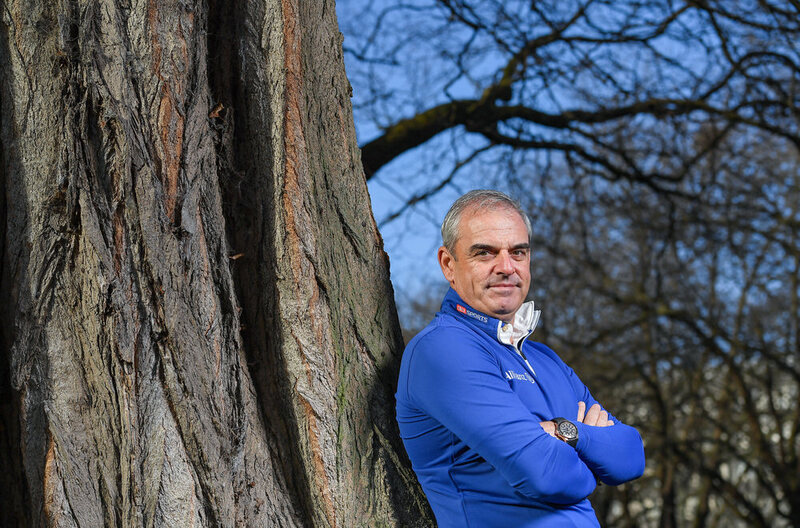 That's the view of Sky Sports analyst Paul McGinley, who believes that McIlroy must persuade himself that he is chasing, not the final leg of a career grand slam, but the first of multiple career slams and a place alongside Jack Nicklaus and Tiger Woods as one of golf's all time greats. Whatever the result, McGinley is expecting a clash of the titans at Augusta National next week as so many of the game's top players arrive in Georgia at the top of their games. Form is important when it comes to winning the Masters with five of the last six champions all lifting a trophy within four months before pulling on the famous green jacket. McIlroy's last win was six months ago but the rules hardly apply there, so close has he come to wins before and after his six-week injury layoff. What excites McGinley is the prospect of this new generation of players finally going head to head for a major win with McIlroy, Dustin Johnson, Jordan Spieth, Jason Day, Hideki Matsuyama Rickie Fowler and Jon Rahm coming up against perennial Masters contenders like Phil Mickelson, Adam Scott and Bubba Watson. "I think you are going to see a real good battle this year of the powerhouses in the game," McGinley said in a promotional press interview for Sky Sport's Masters coverage some four weeks ago. "What we have been missing from the game in the last two or three years is the powerhouses going head to head. The mix with Rickie, and Rory and Matsuyama has now joined them. Jason Day, a former No 1. "We want to see two or three of those heavyweights going at it. Sport thrives on rivalry. Every sport. And if you don't have rivalries, it is not quite the same." As an Irishman and an admirer of McIlroy's, McGinley hopes to see the young Holywood man fulfill his date with history as he bids to become just the sixth player to complete the modern career Grand Slam and join Gene Sarazen, Ben Hogan, Gary Player, Nicklaus and Woods on the Mount Olympus of golf. Like Danny Willett, who came into the Masters last year feeling rested after the birth of his first child, McGinley believes that freshness could be a factor for McIlroy this year. "There was a freshness about Danny and when he got into contention on Sunday," McGinley said. "There was a freshness about him, he was having a great day, he didn't have to deal with the pressure that Jordan had every night of doing press conferences, sleeping on the lead. He was coming up on the rails. There was a freshness about him and when the opportunity presented itself, he was able to go over the line." McIlroy ticks all the boxes required of a Masters champion and even if his putting lets him down at times, the rest of his game is so good that he doesn't have to putt exceptionally to win a green jacket. What he does have to avoid is believing that a win is inevitable and doesn't ends up like Tom Weiskopf, Greg Norman or Ernie Els - three "certainties" to win the Masters who never pulled it off. "This talk that his game is suited to winning at Augusta, his game is perfect for Augusta, is very dangerous talk," McGinley said. "And hopefully, he is not listening to any of that noise because that is terrible talk. "They said that about Greg Norman, he never won a Masters. They said that about Ernie Els. He never won a Masters. That's dangerous talk, and I am sure he is not listening to that. "He knows how to play the golf course with the lead that he had in 2011. He knows how to play the course, and he knows how to get it around there. "And he has obviously got the heart to win major championships. We have all seen that. We all know that. He has all the skill set required to win around there. We all know that. "The challenge for Rory is that he is on the threshold of history. And there is a reason why only five guys have won the grand slam - it is because it is such a big step up. Phil Mickelson hasn't done it. He is still waiting on a US Open to complete the grand slam. "It is a big, big, big mental challenge to get over that line and join the history of all time history in golf. And we have an Irishman standing on that threshold. That is the challenge for Rory. There is a reason why only five have done it." McGinley believes that McIlroy should not be aiming for the career grand slam but multiple career slams. "Personally, I'd love to see him — and I am not one to speak for Rory and tell him what to do — but there is another elite group: Woods and Nicklaus. They are the only players in the world in the history of the game who have won multiple Slams. Rory is not a million miles away from that either. "And it is exciting. It is challenging. But it is a big, big, big mental hurdle. And that is why Rory needs all the focus he can; the focus on joining history and not to be left with one major as part of his trophy cabinet." The challenge gets tougher every year but McGinley believes the great ones rise to such challenges. "These players, their mindset is not the same as maybe me or you. That's why they are major champions. They thrive on making history." The reality is that Woods and Nicklaus were head and shoulders above the rest and they knew it. Is McIlroy? "No, he's not," McGinley replied. "Because the guys around him are unbelievably strong players. He is not head and shoulders above them. If you ask me, all on their game, playing their best, who is going to win? I am backing Rory. But only by a short head. His performance in the majors last year, you know... Yeah, he won the FedEx at the end of last year, but his results are not showing he is ahead and shoulders above the rest compared to where Tiger was. And he will be the first to admit that. "As I said before, these guys challenging Rory are great news for Rory. He thrives on people putting it up to him. He thrives on players winning and achieving and creating a whole load of conversation around them - oh, he's the best. "But when Rory got in his rear view mirror at the FedEx Cup last year, there was only one winner. That mindset Rory had at that FedEx, it's a long time since I saw him like that. I watched that. I was in Florida at the time and I watched it live with a friend of mine for the last five holes and then the playoff. "The mindset, the focus, the aura, the place where Rory was mentally for that hour and a half, it had been a while since I saw him there. That was Rory at his very best. He had one thing on his mind. He was going to win that FedEx. He was going to do it. There was a joyfulness about how he did it. There wasn't a grim determination like when Tiger played. "When Rory plays, there's a joyfulness when he plays the game. We are all with him and all watching him. We watch his exuberance. When he holed out his wedge shot on 16 for a two to get right up there with the lead, the exuberance on his face, the pure joy, the ecstasy, we all bought into it. He jumped off the tv. Then immediately he was back into focus again. That's what we need from Rory. We know he can do that. That's the mindset he needs for Augusta." Some believe that McIlroy might be better off coming from behind to win at Augusta but McGinley knows that players like McIlroy like to do it on the front foot and in the full glare of the spotlight. "As I say, the mindset of guys like Rory compared to me or you is very different. I didn't win majors, but I can see the mindset. They thrive on having all the attention on them and being centre stage. They thrive on that. "So not everybody is going to succumb to the pressure. And I think Rory is one who has proved himself on so many occasions now in the heat of battle that he has the heart to do it. I think joining history and hopefully, not just joining the Grand Slam club but joining the double grand slam club is what is going to drive him during this Masters. "If we can see the focus that we saw in that last round when Dustin Johnson was just ahead of him and he was chasing him down, stalking him down, he was jumping off the TV. His focus was awesome. "But he also had that balance of joyfulness when he plays. He dances down the fairways but there is a real determination and focus about where he is going." Paul McGinley leads Sky Sports’ coverage of the US Masters 2017. Sky Sports’ live coverage of the 2017 Masters in Augusta gets underway on April 5th with expert insight and analysis from former Ryder Cup captain, Paul McGinley, and Butch Harmon. Sky Sports’ award-winning coverage will commence on Monday April 3rd from the Augusta practice range before coverage of the Drive, Chip and Putt Championship followed by the Masters Par 3 Contest on Wednesday, April 5th. Sky Sports’ four days of live tournament action will tee off on Thursday April 6th from 7pm. Extra coverage of the featured groups as well as the 15th and 16th holes and Amen Corner will be available live from 1.15pm* to all Sky Sports subscribers who press the red button. McGinley on Rory's Masters destiny: "There's no such thing as a foregone conclusion in golf"
As Masters approaches, McGinley fears for Rory after Trump backlash: "He doesn't need this noise"
McGinley: "Rory needs closure on his equipment"
McGinley: "Rory has unfinished business at Augusta"
Ryder Cup skipper Paul McGinley is backing Rory McIlroy to end Europe’s long Masters drought and take care of "unfinished business" at Augusta National. "If Shane tries to be Pádraig, he won't win"